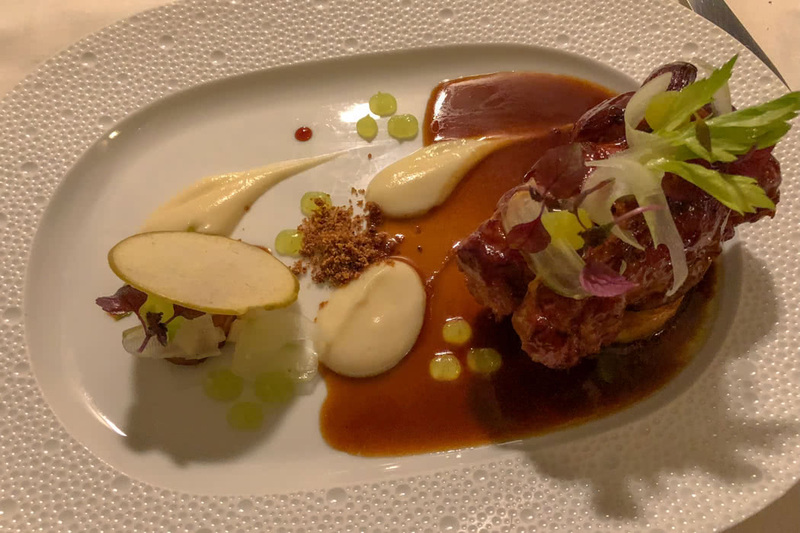 If there is only one fine dining restaurant that you visit in your lifetime, it should be Il Lago at Four Seasons hotel in Geneva. 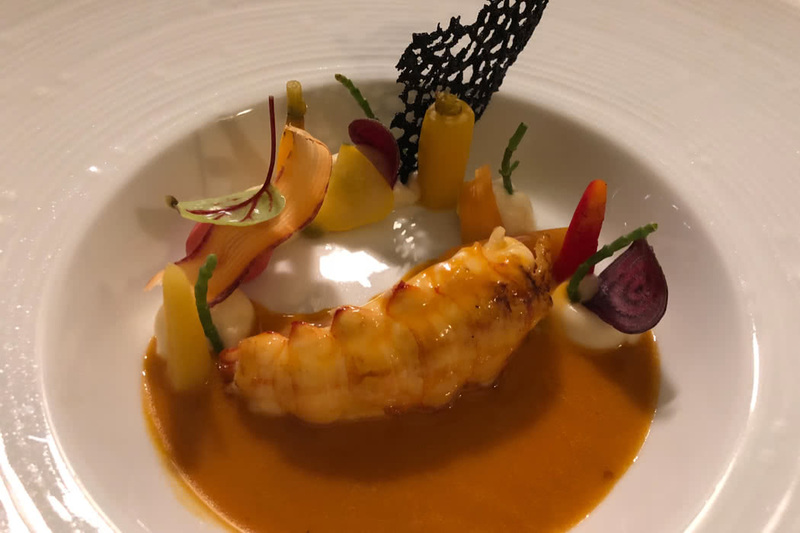 I have eaten out around the world and can only think of two restaurants which come close; Veranda at Four Seasons Cap Ferrat and Marcel Ravin at the Blue Bay in Monaco. 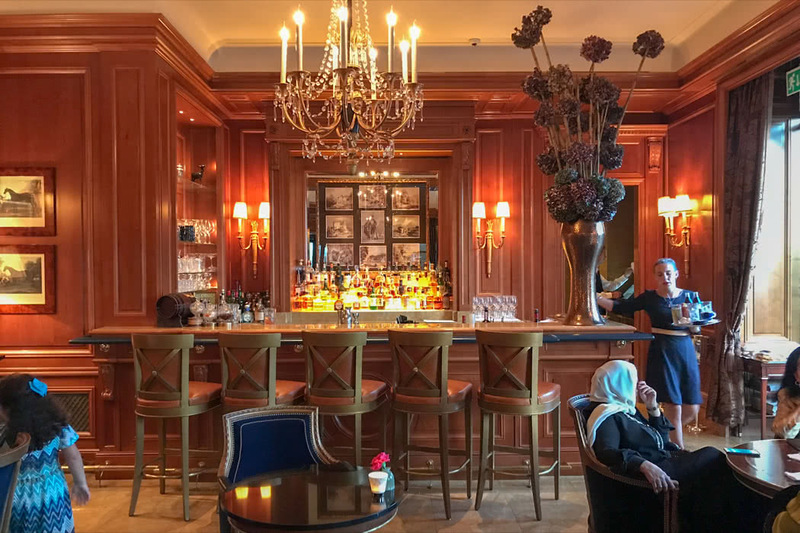 Il Lago also forms one entrance to the Four Seasons hotel in Geneva which is one of the most luxurious hotels in Geneva. 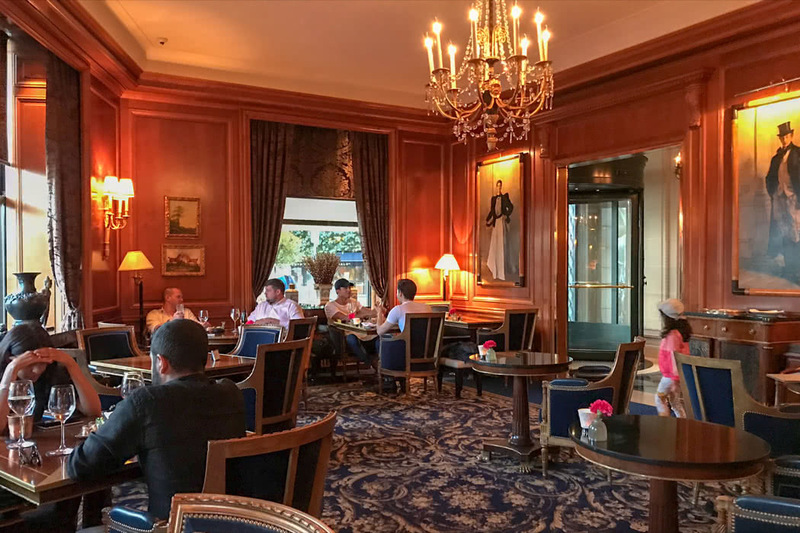 The hotel is a mass of magnificent and historic corridors leading onto majestic bars and lounges, all encased in marble and dark woods. It offers a playground for the wealthy bankers and rich tourists. I cannot comment on the rooms above, but judging by the communal areas, they would have been just as immaculate and historic as down below. But I digress and will return you to the Il Lago terrace. The restaurant spills out a decked area that overlooks one of the prettiest streets in Geneva. 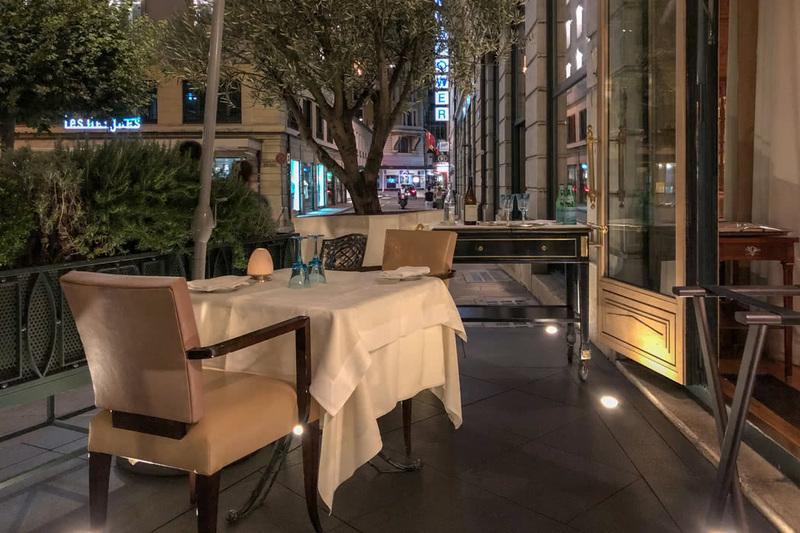 The decking is protected by olive trees and flowers, candlelit and romantic, whilst still is undoubtedly in the heart of Geneva. Sounds of clip-clopping horse-drawn carriages mix with the farty exhausts of the occasional Ferrari (which all, by the way, seemed to be stopping by the Four Seasons), but somehow the protective olive trees and greenery simultaneously whisked to a romantic garden on a Tuscan hillside. 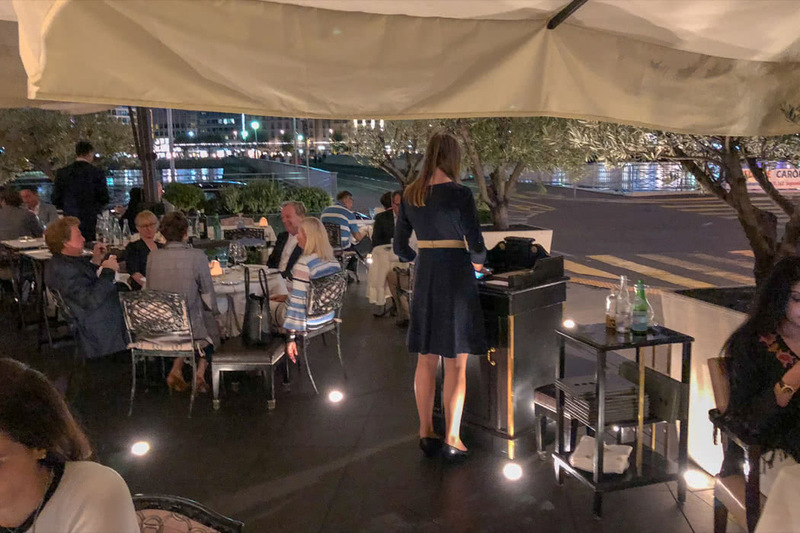 This alfresco eaterie is just across the water from historic lakeside buildings which stand to attention, topped with sparkling letters from Cartier, Hublot and Rolex, which light up the night sky. The brilliant Italian waiters take you on a culinary journey down the Amalfi Coast, over to Sicily and beyond. 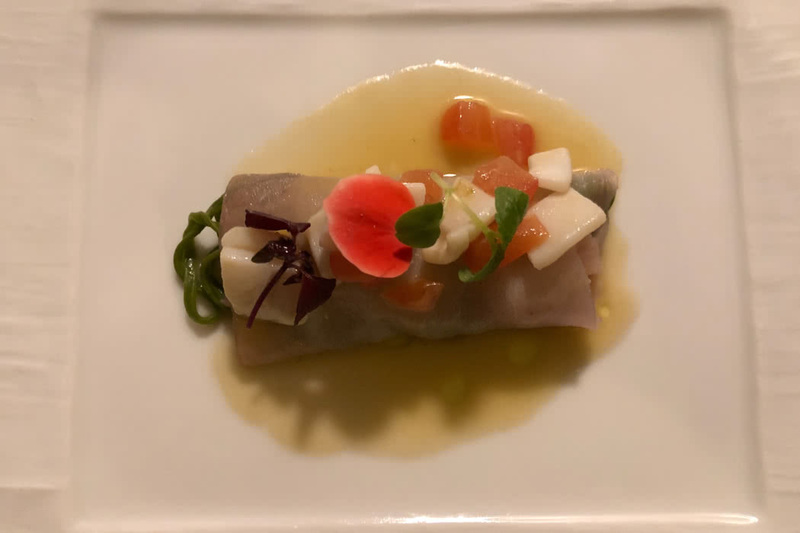 They describe each dish by painting a picture in your mind; “The fish is from the crystal clear waters that lap the rocks in Capri”, “This mountain goat was tended by a loving shepherd who hand-rears his animals on a hillside North of Rome”… “The olives grew on the sun-drenched Tuscan hills”. You get the picture! What did I choose? 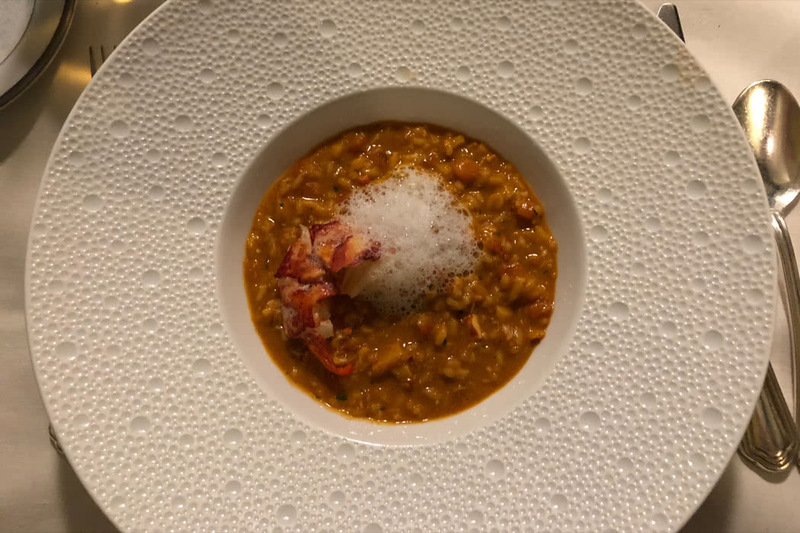 Lobster risotto garnished with foam, the second dish was melt-in-the-mouth fish and then I chose the goat for main. 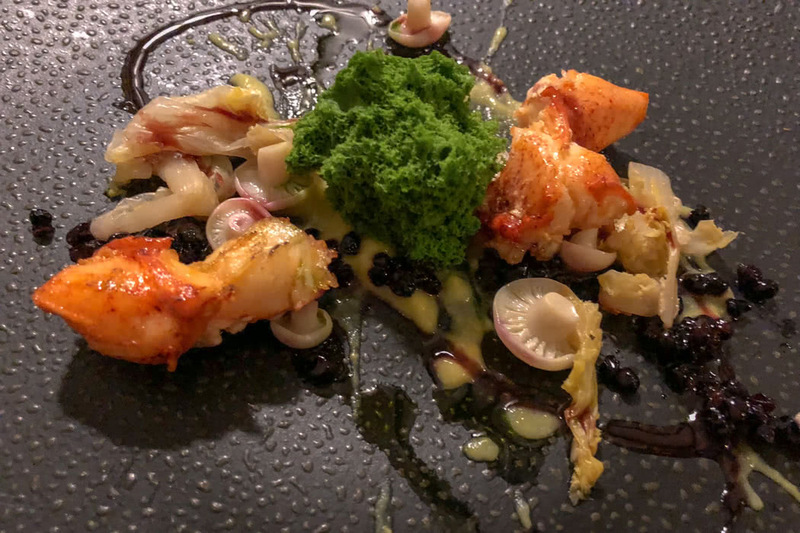 It was simply the most amazing, unfussy and yet clever, mouthwatering Italian food I have ever tasted. Identifying the origins of the flavours helped to understand the delicious dishes better. 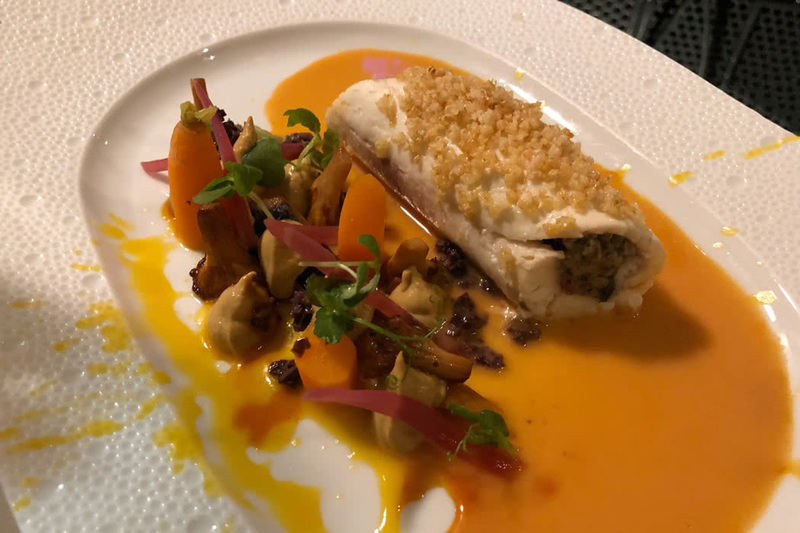 Instead of simply enjoying a gorgeous plate of food, the story took you to that region which made it taste even better. Each dish, from the risotto to the fish to the delicate mountain goat that climbed grassy Italian peaks, was cooked to perfection. After the main, a man on the next door table broke into song, he was having such a marvellous time! He was clearly a professional opera singer so it was like having Pavarotti on the next door table. Amazing! I would be lying if I remembered the details of the dessert. 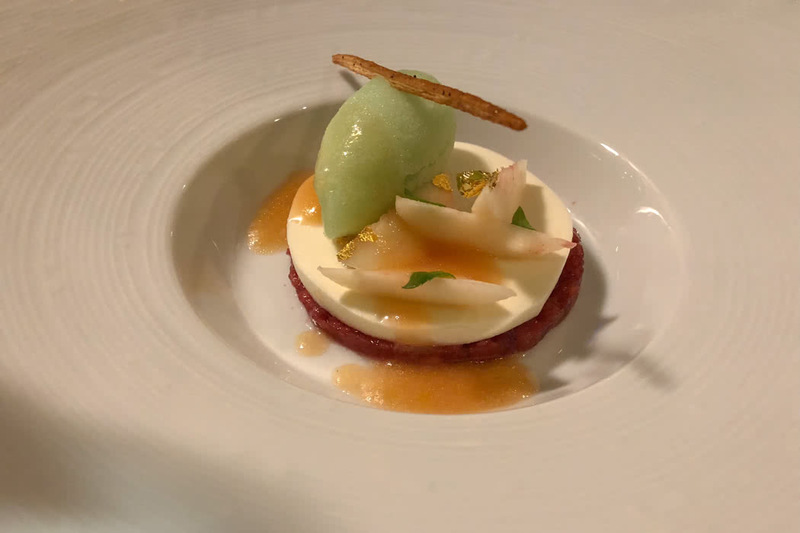 The setting, the singing, the fine dining and the wine, meant the whole evening was going so swimmingly well that I must have dived into dessert without taking the contents in. Such a shame as I am sure it was wonderful! 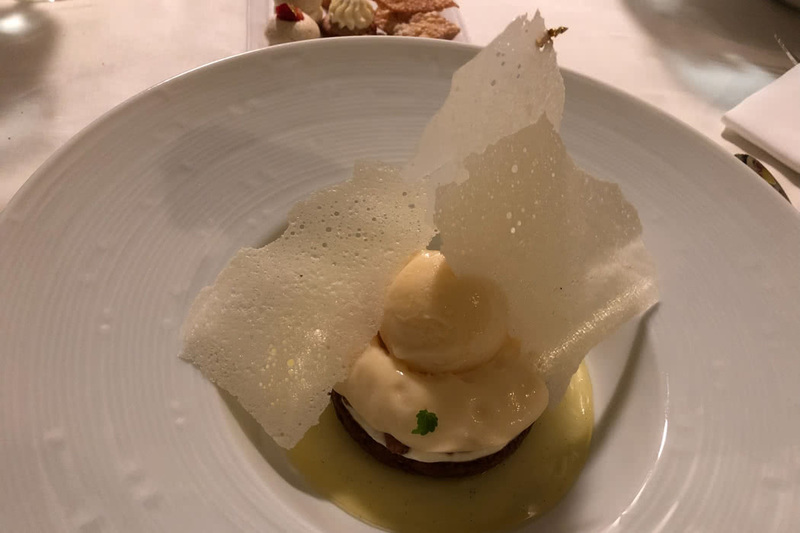 I can tell you that our little boy, who was being treated like a prince, was delivered chocolate and vanilla ice cream smothered in buttons for his dessert and it was the best dessert of his holiday too. Perfection? Yes, dining doesn’t get better than this. Book at stay at the luxury Four Seasons Geneva via our luxury travel concierge to get free breakfast for two people per bedroom, complimentary food and beverage credit of USD100 per stay, room upgrade of one category, based on availability at time of check-in (this usually excludes suites), early check-in/late check-out, subject to availability, basic Internet in all guest rooms and a complimentary welcome gift.